Editor’s Note: This post has been updated following announcements at AWS re:Invent 2018. 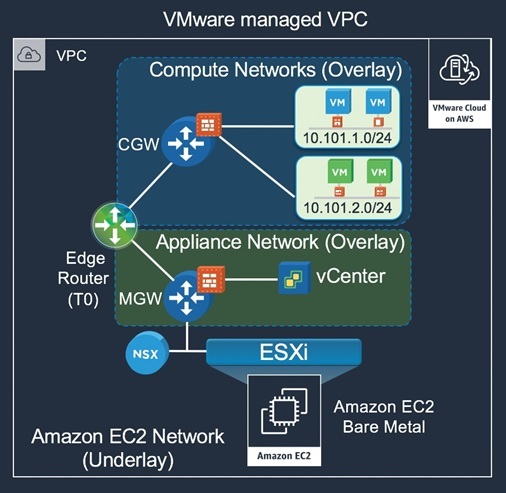 Customers can use their existing AWS Direct Connect (DX) or Virtual Private Network (VPN) solutions to connect to their VMware Software Defined Data Center (SDDC) clusters. With the SDDC deployed on AWS bare metal hardware provided by Amazon Elastic Compute Cloud (Amazon EC2), the lowest network level to start with is the Amazon EC2 underlay network or the Infrastructure Subnet. This network hosts the vmkernal adapters of the ESXi hosts like vMotion, vSAN, and host management networks. VMware uses NSX to control access to this network as part of the SDDC management model, and limits access to only remote traffic required to support features like cross-cluster vMotion. 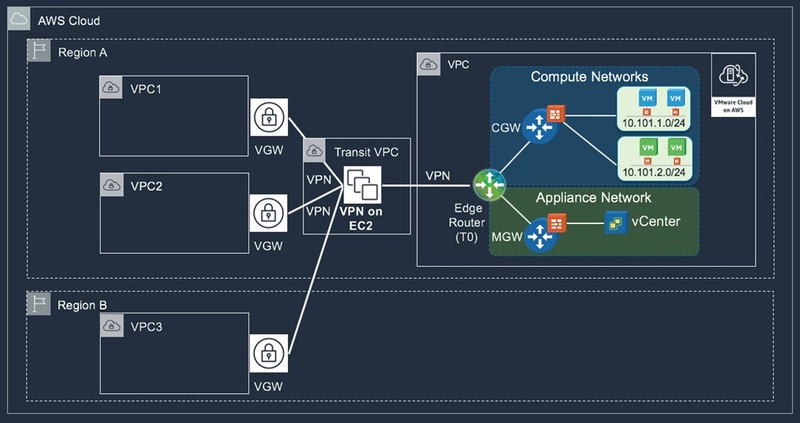 Figure 1 – Networking and security overview in the VMware Cloud on AWS portal. Appliance Subnet used to provide connectivity to SDDC management components like vCenter. This network is created during cluster provisioning with carved out network range from the Infrastructure or Management subnet. Customers can optionally specify the network range of the Management subnet during cluster creation for the purpose of avoiding conflicts with other networks that will need to connect to the SDDC. Access to this network is controlled by the NSX Management Gateway (MGW) through firewall rules and IPsec tunnels. Figure 2 – SDDC network topology. Figure 3 – Connectivity model between SDDC and customer VPC. There are three primary approaches to enable connectivity between SDDCs and customer-managed VPCs (other than the connected VPC where VMware cloud ENIs are provisioned). Choosing the right approach depends on the number of VPCs you will need to connect to and requirements for additional networking services on traffic flow. Before we get into these options, we need to mention that the new NSX-T backed SDDCs support both BGP route-based and static policy-based VPNs. Our recommendation is to always use route-based VPNs unless if not supported on the other end of the connection. We’ll focus on route-based VPN practices in this blog. 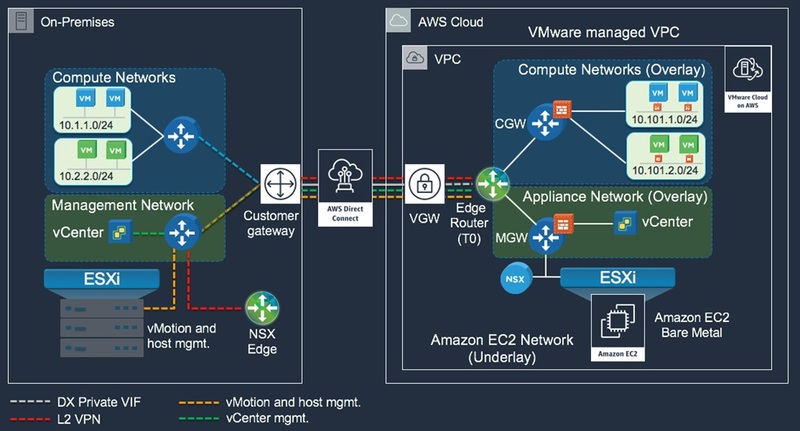 The first approach is to create 1:1 VPN tunnels between the NSX T0 edge router and the different VPCs using the AWS-managed VPN offering (or any Amazon EC2 based VPN, if preferred). To maintain connection resiliency, it’s important to configure both IPSec tunnels provided by the AWS-managed VPN to the edge router. AWS will use BGP to influence the selection of the active tunnel on both sides and failover as necessary. The T0 edge router is highly available by design through active/stand configuration, so it will not be a single point of failure for the connection. This model works well when connectivity is required to small or limited number of VPCs. Figure 4 – Approach 1: Direct VPN tunnels from To Router to customer VPCs. 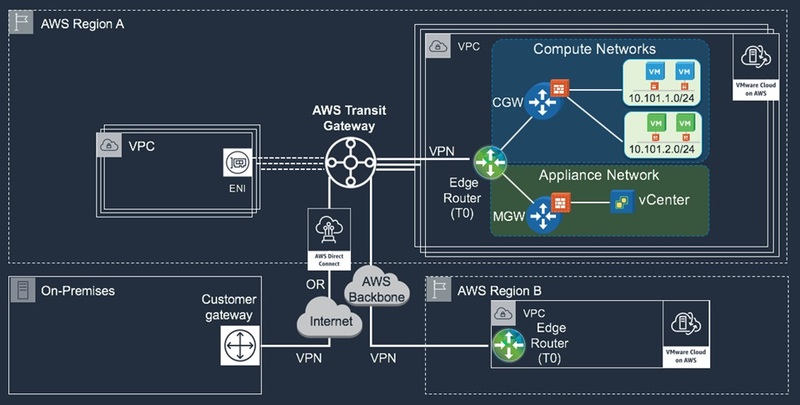 If connectivity is required to multiple VPCs, a different solution using the recently announced AWS Transit Gateway can be used to minimize the number of tunnels and provide simplified hub and spoke routing model for SDDC to SDDC, VPC, and on-premises environments. Figure 5 – Approach 2: Hub and spoke model using AWS Transit Gateway. AWS Transit Gateway (TGW) is highly scalable and resilient. It supports multiple Routing Domains for granular routing and network segregation similar to VRF functionality. TGW can have up to 5,000 attachments per Region, and can burst up to 50Gbps of traffic per VPC attachment. It supports route-based VPNs with Equal-Cost Multi-Path (EMCP) to increase VPN bandwidth by equal traffic distribution across multiple tunnels when advertise the same CIDR block. Native Direct Connect support is coming early 2019. In cases when additional network services, like traffic inspection or IPS/IDS is needed, the Transit VPC approach can still be used. This model suggests the use of third-party software VPN on Amazon EC2 inside a shared/transit VPC. The software router on Amazon EC2 works as a hub that terminates tunnels to the different environments, or spokes. Routing and additional networking capabilities will be provided by the software router based on the software vendor capabilities. Figure 6 – Approach 3: Transit VPC model. SDDC supports integration with AWS Direct Connect service to provide persistent, reliable, and low latency connection to customers’ on-premises environments. DX uses virtual interfaces (VIFs) to enable access to AWS services. Private virtual interface is used to connect to resources inside Amazon VPC. Public virtual interface connects to public AWS services outside VPC boundaries, such as Amazon Simple Storage Service (Amazon S3), Amazon Glacier, and EC2 Elastic IP addresses (EIP). AWS Direct Connect is a multi-account service. Connection owners can create and share virtual interfaces with different AWS accounts in a hosted virtual interface model. 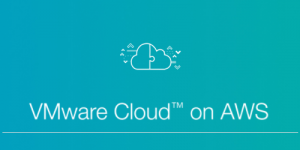 VMware Cloud on AWS supports the hosted virtual interface model. 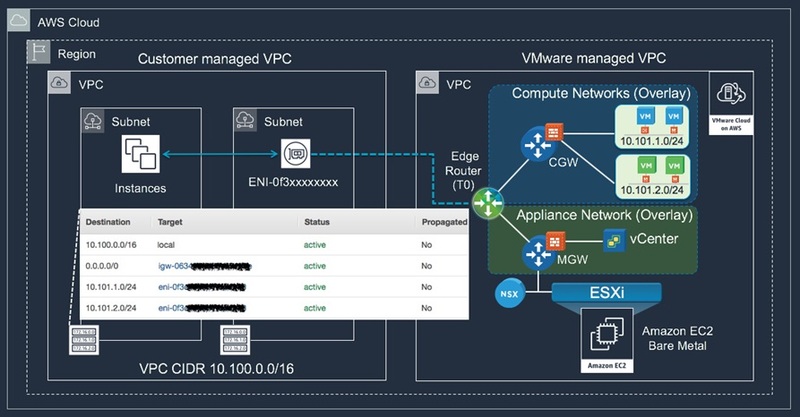 SDDC customers can create private virtual interfaces from DX connections that they own or request from AWS Partner Network (APN) Partners, and attach to the VMware managed VPC where the SDDC resides. 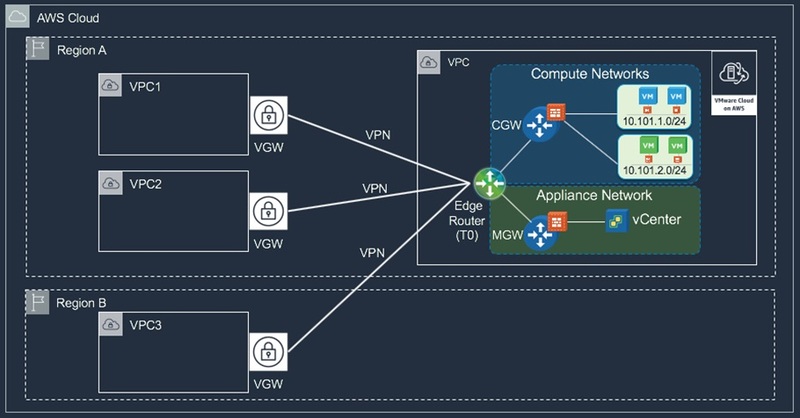 The new VMware Cloud on AWS SDDCs backed by NSX-T networking provides full routing support for Infrastructure (underlay) and overlay networks over a single Virtual Private Interface. This model simplifies the routing requirements between SDDC and on-premises environments using BGP routing without the need for VPN tunnels, unless if encryption is required. Figure 7 – SDDC integration with AWS Direct Connect. In the case of Private VIF, T0 edge router utilizes a private IP from the Appliance subnet space that gets advertised to customer site over Private VIF. VPN tunnels created to the private IP gets routed over the Private VIF by default with no need for additional configuration. In the case of Public VIF, T0 edge router utilizes a public IP from AWS public space that gets advertised to customer site over Public VIF. VPN tunnels created to this Public IP will be routed over DX Public VIF when the on-premises edge router’s public address is included in the customer advertisements to AWS. This provides enhanced connectivity over AWS backbone for the VPN traffic vs. routing over Internet. One of the most popular and core features of VMware vSphere is vMotion—the ability to live migrate workloads from one physical host to another with no downtime. vMotion capability was later extended to support cross-cluster, cross-vCenter, and long-distance live migrations. These features pushed infrastructure capabilities to its limits to support and maintain reliable migration operations. L3 connectivity between source and destination vMotion and host management networks. This routing flow can be enabled by Private VIF between on-premises and the SDDC. The Private VIF will enable L3 connectivity between the SDDC underlay (vMotion and host management) and related on-premises networks. L3 connectivity between source and destination vCenter Servers. Same as above. The Private VIF will enable L3 connectivity between the SDDC Appliance network and related on-premises management network. L2 stretch to maintain addressing during VM migration. This extension can also be routed over the same Private VIF. It requires an L2 VPN between the T0 edge and on-premises NSX edge VPN client, which is a free download for VMC customers. Figure 8 – Network requirements for vMotion between on-premises and SDDC.